12+ Cat Fabrics that You Need in Your Stash! I thought I'd show you my favorite cat fabrics and where to buy them just in case you were looking. The fabrics above are from the Tabby Road Collection by Tula Pink. I'm swooning! The adorable smiling kitties I used on my Card Kitties are called Contented Cats Mitzi from Lewis & Irene. They are hard to find already, but the blue colorway is currently available on Etsy and the Linen colorway from Fabric.com. Sarah Watts (Cotton + Steel) has designed cat fabrics that I can hardly resist - above left is a panel print called From Porto With Love. She also designed a whole collection called Cat Lady that I have fat quarters of in my C+S Collection. Stacked Cats (above right) is one of my favorites from that collection. And Schmitties (also from Sarah's Cat Lady Collection) is on sale right now at Craftsy! Check out this adorable cat fabric from Andover called Crafty Cats. I think I have to have that coordinating floral too! 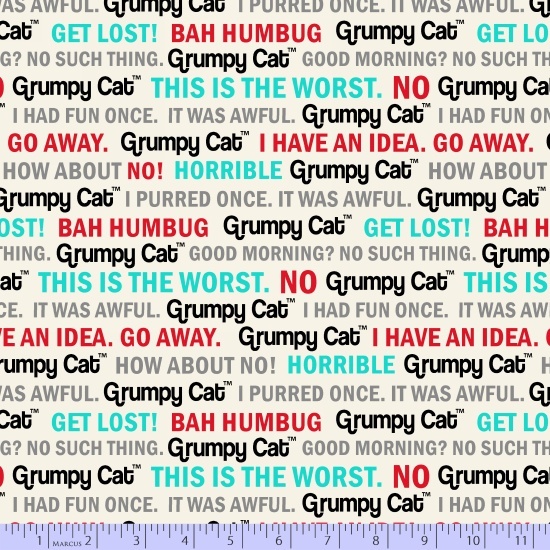 If Grumpy Cat is your favorite feline, Marcus Fabrics has a whole Grumpy Cat fabric collection with blenders! Day of the Dead Kitty (from Timeless Treasures) to your cat fabric stash too! After you buy some cat fabric, sew up my Card Kitty free sewing tutorial here!